KATHMANDU, Jan 13: The Trekking Agencies’ Association of Nepal (TAAN) is set to conduct its yearly “Joint–Lhosar Cultural Event” on 11th February at Hotel Hyatt Regency. 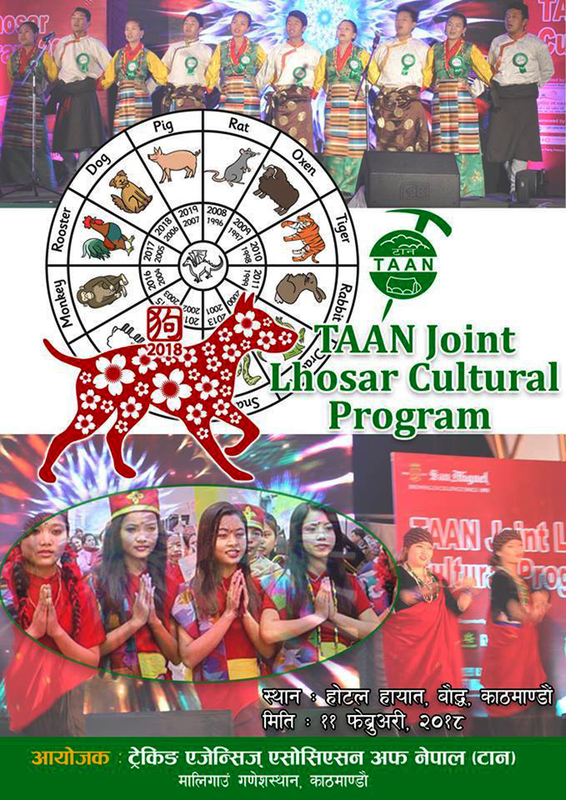 TAAN Joint-Lhosar Event is a joint celebration of the New Year festival of a number of ethnic communities of Nepal including Sherpa, Gurung, Tamang, Hyolmo etc. Lhosar is the New Year festival of different ethnic groups of the mountain and hill areas of Nepal. Though these groups celebrate Lhosar on different dates, TAAN has been organizing a cultural event every year to celebrate the festival. Cultural performances of different ethnic groups mainly Gurung, Tamang, Sherpa and Hyolmo will be the major attraction of the event along with the performance of popular Nepalese artists. TAAN plans to make the event a huge success as a tourism product where high-ranking government officials, diplomats, representatives of different travel trade entrepreneurs, and tourism entrepreneurs will also be participants. The major objective of this event is to preserve Nepal’s timeless culture and tradition and maintaining friendly and brotherhood relationship among tourism entrepreneurs. The event is going to be organize under the supervision of Ritu Gyamdan Tamang, the coordinator of Sports and Event Department. Along with her, Ranjan Raj Bhandari is the co-coordinator and other members are Baburam Gurung, Suk Bahadur Gurung, Purna Kumar Sherpa, Gopal Shrestha, Jeeban Hyolmo, Surya Bahadur Bhetwal, Pasang Sherpa (Chhelhamu) and Dolma Tshering Tamang Sherpa. Gopal Shrestha, Coordinator of Media & Communication department said that TAAN will organize an official press meet targeting TAAN Joint- Loshar Cultural event.